In his Systematic Theology (1871–1873), Hodge, professor of Oriental and biblical literature at Princeton, made four arguments for why Darwinism was untrue and unacceptable for Christians. One, it offended humans’ common sense to be taught that “the whale and the humming-bird, man the mosquito, are derived from the same source.” Two, the theory posed that the complexity of nature could arise without an intelligence directing it. Three, the theory utterly discounted religious convictions. Four, the theory could not be proven, because the origins of life could not be observed scientifically. Hodge’s rejection of Darwinism contrasted with Princeton University’s president James McCosh’s (president, 1868–1888) beliefs that the theory would be someday proven and Christians needed to adapt their thinking to it. Until the seminary took a modernist turn in 1929, American Presbyterians received two intellectual lineages from their flagship educational institutions. The university advanced the idea that evolution was God’s way of working in nature, while the seminary taught that faith in biblical inerrancy necessitated rejection of Darwin. In an 1879 letter, Charles Darwin wrote, “It seems to me absurd to doubt that a man may be an ardent theist & an evolutionist.” Darwin knew these beliefs could be compatible because both were held by his longtime friend and champion Asa Gray. Gray, a noted botanist, taught at Harvard alongside Louis Agassiz. He met Darwin at Kew Gardens in London in 1838 and began correspondence with him in 1855. Gray had developed similar ideas on his own and was immediately convinced by Darwin’s theory. He even arranged for the American publication of Origin of Species. But Gray disagreed with his English friend on the subject of religion, repeatedly trying to convince Darwin that his system left room for God’s design and occasional intervention. Darwin demurred. 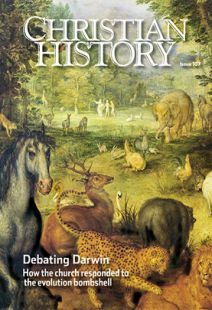 Nonetheless, Gray included his theistic synthesis when he promoted Darwin’s ideas—efforts that greatly aided the acceptance of evolution in America. His first publications cataloged freshwater fish; next he moved on to glaciers and became the first scientist to argue for an Ice Age. After this, he completed a comprehensive, annotated list of the botanical genera and group names for all known animals. Invited to Boston in 1846 to deliver a lecture series on “The Plan of Creation as Shown in the Animal Kingdom,” he decided to stay, becoming a professor at Harvard. Agassiz’s wide-ranging expertise—his subsequent lecture series ranged from “Comparative Embryology” to “Deep Sea Dredging”—contrasts with twenty-first-century academic specialization. His centrality to the American scientific enterprise cannot be matched now. A generation of scientists worked with him. Agassiz was one of the last scientists of international repute to deny Darwinism. He rejected the theory on both scientific and philosophical grounds, maintaining until his death that different species were separate, special creations of God. The course of this pugnacious Canadian’s life was set when, after the 1882 death of his father, his mother joined the Seventh-day Adventists. The church had arisen some decades earlier under the leadership of visionary Ellen G. White (1827–1915). Price became a leading interpreter of White’s views to outsiders, writing many articles and over 30 books. He taught at Adventist colleges and spent four years in Britain, where he debated British rationalist Joseph McCabe in 1925 in an exchange inspired by the Scopes Trial. Price maintained that “true” inductive science would keep facts and theories distinct and that evolution remained an unproven theory. Like his friend Agassiz, Guyot was born in Switzerland, studied widely at a number of European universities, and examined Alpine glaciers. Eventually, political revolutions caused Guyot to follow Agassiz to the United States, where he set up weather stations and revised geography curricula before securing a faculty position at Princeton University in 1854. He spent the rest of his career there, traveling during vacations to map and measure the Appalachian Mountains. Union forces used his maps during the Civil War. Two peaks along the Appalachian Trail bear his name, as does a mountain in Colorado. Guyot made his most lasting contribution in meteorology. His plan to arrange observation stations around the country to aid in predicting storms laid the foundation for the National Weather Service. The founders of Vanderbilt University thought they had achieved a coup when in 1875 they offered a chair in geology, zoology, and botany to Alexander Winchell—scientist, author, speaker, and preeminent interpreter of science for the Methodist Episcopal Church. Winchell thought that evidence of evolutionary development displayed the unity of nature and the design of its creator. This theistic evolution was fine at Vanderbilt, but Winchell’s ideas about race were not. His theory that whites and African Americans descended from different Adams led to his 1878 dismissal. Winchell found many supporters in the North and finished his distinguished career at the University of Michigan. The future president’s uncle, a Presbyterian minister, served as Perkins Professor of Natural Sciences in Connexion with Revelation at Columbia Theological Seminary in South Carolina. In his 1861 inaugural lecture, he affirmed the literal truth of the Bible and assured his listeners that no scientific discoveries—including those of geologist Charles Lyell, but not yet Darwin, whose work was practically unknown in the American South—could contradict the Scriptures. Elesha Coffman, former managing editor of Christian History, is assistant professor of church history at the University of Dubuque Theological Seminary.